Dials in the Chernobyl First Block control room once showed the depth of each control rod in the reactor core. Just down the hall is the burnt-out Fourth Block control room, where a combination of design flaws and human error triggered the accident during a late-night safety test. 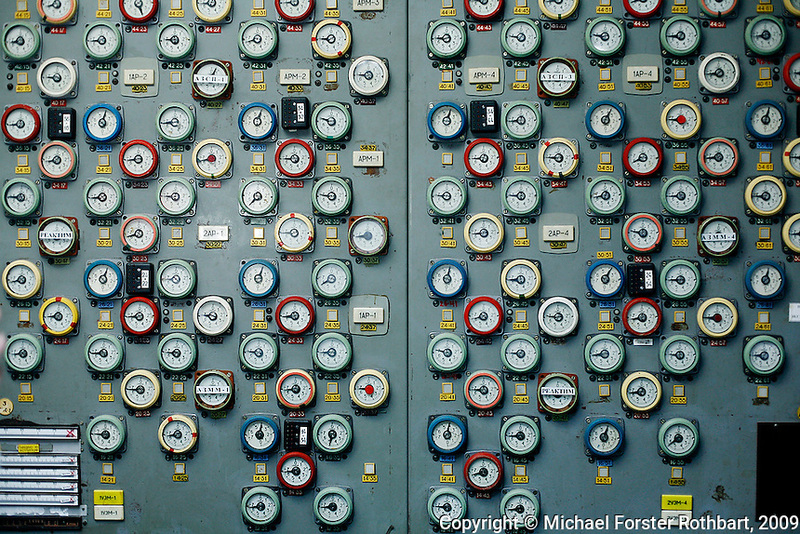 Original caption: .A wall of dials in the Chernobyl First Block control room once marked the depth of each control rod in the reactor core. Just down the hall is the burnt-out Fourth Block control room, where a combination of design flaws and human error triggered the accident during a late-night safety test. Most estimates say ninety-five percent of the radioactive materials remained on the grounds of the power plant or spread to the adjacent forest. Both were decontaminated, using the labor of about 850,000 liquidators from across the Soviet Union..-------------------.